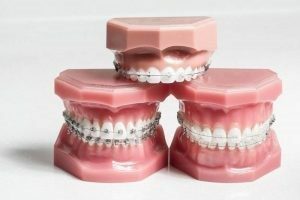 Braces, also known as orthodontic brackets or orthodontia, are commonly used among teenagers and adults to correct crooked teeth, misaligned upper and lower jaws, and uneven bites, including overbites and underbites. Braces are generally provided by an orthodontist, a dental specialist who has received additional training in providing this type of treatment, and who is qualified to determine which type of braces are the best option for each individual patient. Dental braces do more than help your teeth and smile look better – getting braces is good for the health of your teeth! Misaligned teeth affect the way you chew and speak, and can actually promote tooth decay, especially in the areas that are difficult to clean because of overlapping teeth. Advances in orthodontics not offer patients multiple treatment options, including mini braces that come in colors, ceramic (tooth-colored) braces, gold braces, and invisible braces, such as Invisalign®, that can re-align your teeth without anyone knowing that you are wearing them! When you meet with your orthodontist, he or she will help you determine the best treatment option for you. Metal Braces – Traditional metal braces are the most common type of orthodontic treatment available. 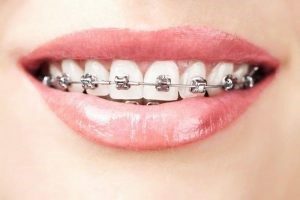 While very effective and commonly used, metal braces are also highly visible, which causes many people to shy away from receiving this type of braces. Ceramic (Clear) Braces – Ceramic, or clear, braces are much less visible than metal braces, and are designed to blend in with the teeth. They are equally as strong and effective as metal braces, and do not stain. Gold Braces – Gold braces are the same as traditional metal braces, but are made of gold-plated steel. There are no advantages of gold over steel in terms of treatment, other than the cosmetic appeal. Lingual Braces – Lingual braces are an alternative orthodontic treatment for patients who want a more discreet treatment than traditional braces. Lingual braces are placed on the inside (tongue side) of the teeth, making them nearly invisible to others. 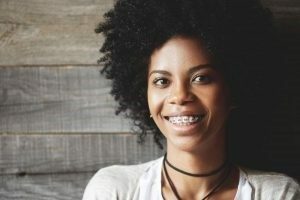 Patients who choose to receive lingual braces can undergo their complete orthodontic treatment without suffering the cosmetic detractions and stigma association with wearing braces. Lingual braces are the preferred option for patients who want their braces to be truly invisible. 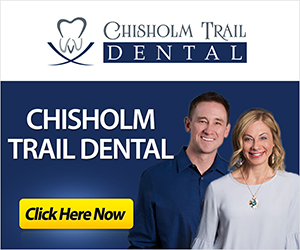 Clear Aligners (Invisible Braces) – Clear aligners, such as Invisalign®, are a great treatment option for patients with only slight orthodontic problems. These aligners are computer-designed from clear plastic, and are removable, making them comfortable, and making it easy for you to eat, brush, and floss throughout your treatment. Invisible braces work by making gradual changes to your teeth as you switch your aligners out every couple of weeks. This type of braces is virtually undetectable, and easily goes unnoticed while you are speaking or in social situations. Braces work by applying pressure to the teeth, moving them gradually over time into the desired position. In most cases, braces are fixed, meaning that they are attached to the molars and bonded to the enamel of the teeth. They cannot be removed by the patient. In more serious orthodontic cases, headgear or another orthodontic appliance may be required to keep the upper jaw back as the lower jaw grows to catch up. The average treatment time for braces is about 2 years, but may be longer or shorter depending on your specific case and the type of braces used during your treatment. Following the completion of your braces treatment, your orthodontist will fit you with a custom retainer. Retainers help to keep your teeth in their correct positions while the teeth, roots, and supporting bone structure settle into place. Wear your retainer as directed. Failure to wear your retainer often may result in your teeth shifting back into their old positions, causing you to need orthodontic treatment again. Oral hygiene is extremely important while you are undergoing orthodontic treatment. Braces can make it difficult to effectively clean your teeth. Your orthodontist will teach you how to clean both your teeth and braces properly. Please continue to visit your family dentist during this time to ensure that you do not develop any problems, such as tooth decay.